…The language of the Vikings, Old Norse, has influenced the development of English more than any other language besides French and Latin. 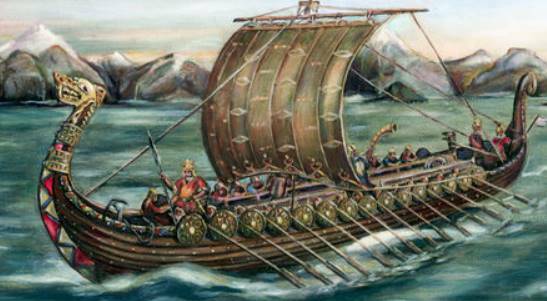 The Swedes, Norwegians, Icelanders, and Danes all spoke Old Norse in those days, usually called the “Danish tongue.” In the 11th century, Old Norse was the most widely spoken European language, ranging west with Leif Erickson’s colony of Vinland in modern-day Canada, east with the Viking settlers on the Volga River in modern-day Russia, and south with warriors battling in modern-day Spain, Italy, and North Africa. Today Old Norse words are most common in the Yorkshire dialect, but the Danelaw included the East Midlands, York, Essex, Cambridge, Suffolk, Norfolk, Northampton, Huntingdon, Bedford, Hertford, Middlesex, and Buckingham. When it comes to English words for which we are indebted to Old Norse, let’s start with they, their, and them. It’s true. If it weren’t for the Vikings, we might still be using the Old English words hîe, heora, and him instead. Or maybe not—when him and them mean the same thing in a language, you know it’s time for a change. In fact, English received many really, really common words from Old Norse, such as give, take, get, and both. And sale, cake, egg, husband, fellow, sister, root, rag, loose, raise, rugged, odd, plough, freckle, call, flat, hale, ugly, and lake. Many English words that begin with sk or sc came from Old Norse, such as skin, sky, score, scant, scrub, scathe, and skill. Old Norse words that feature two-letter blends and a high consonant-to-vowel ratio just sound Viking to me, especially if you pronounce both letters as the Vikings originally did: knife, snare, snub, wrong, bread, dwell, bask, dream, steak, stammer, and especially thwart. Tomorrow, more words from Old Norse.